Part of an ongoing series to introduce the Vital AI software used to make predictions. Now we’re ready to run our machine learning algorithm on the data. 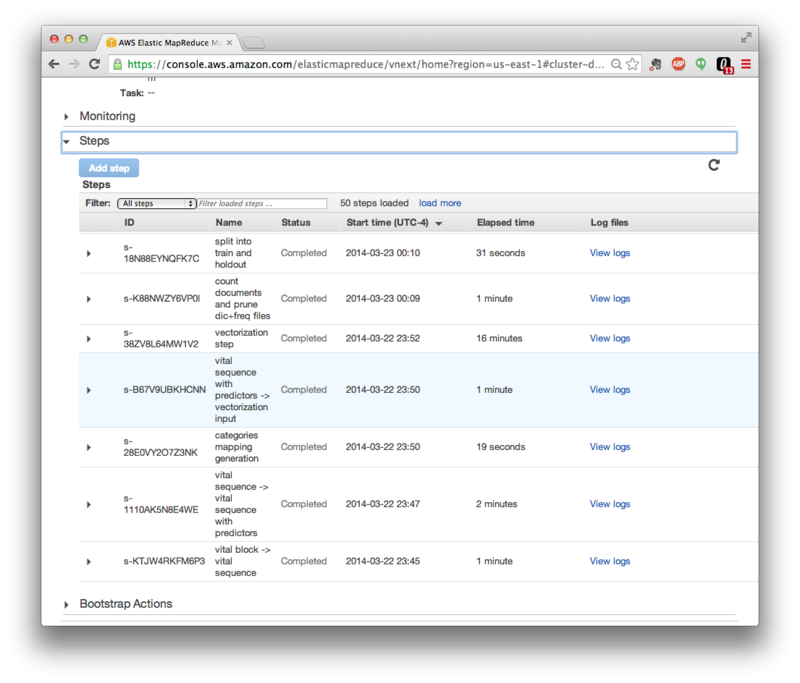 We’ll be using Amazon’s Elastic Map Reduce service for Hadoop. The s3cmd for accessing Amazon’s S3 service should be installed, as well as the elastic-mapreduce command line to interact with Amazon’s EMR service. vitalhadoop start --create --alive  --num-instances 2  --master-instance-type m1.xlarge --slave-instance-type m1.medium  --vital-bootstrap-action s3:// mys3bucket/bootstrap-action/configure-hadoop-vital.sh  --log-uri s3n://mys3bucket/logs/  --name "TwentyNewsgroup Example"
This shows the results for the “holdout” data — data classified by the model that the model has not seen before. The model correctly classified 88.95% of the instances. Not bad! The results also show the “confusion matrix.” This is a matrix of category vs. category — perfect would be all numbers along the diagonal — errors are shown when the instance was in a category but the model categorized it into a different category, and thus not along the diagonal. Final part of a series to introduce the Vital AI software used to make predictions. Now that we have the predictive model produced in the previous step, we can use it to make new predictions. In order to make a prediction, we need an instance of the data object with properties set which will be the input features to the model. Here is a snippet of code to load the model, instantiate a data object with properties, make the prediction, and output the result. Now we can use such code in our application to make ongoing predictions. The “baseball” category was the top choice, with a score of 0.2307. Hope you enjoyed this introduction to the Vital AI software. We will present similar series for Natural Language Processing, Graph Analytics, Logical Inference, and other topics. Please contact us for additional information and to start using the Vital AI software!